This paper explores how watershed organizations in Appalachia have persisted in addressing water quality issues in areas with a history of coal mining. We identified two watershed groups that have taken responsibility for restoring local creeks that were previously highly degraded and sporadically managed. These watershed groups represent cases of self-organized commons governance in resource-rich, economically poor Appalachian communities. We describe the extent and characteristics of links between watershed group volunteers and watershed residents who are not group members. Through surveys, participant observation, and key-informant consultation, we found that neighbors – group members as well as non-group-members – supported the group's function through informal neighboring acts. Past research has shown that local commons governance institutions benefit from being nested in supportive external structures. We found that the persistence and success of community watershed organizations depends on the informal participation of local residents, affirming the necessity of looking beyond formal, organized groups to understand the resources, expertise, and information needed to address complex water pollution at the watershed level. Our findings augment the concept of nestedness in commons governance to include that of a formal organization acting as a neighbor that exchanges informal neighboring acts with local residents. In this way, we extend the concept of neighboring to include interactions between individuals and a group operating in the same geographic area. It was around March 2008 – and I just started getting calls on my phone where the creek had changed colors and it started turning red. I had been used to the creek being red my whole life, but now everyone was calling and saying, “There's something wrong with the creek, it's turning red. Somebody's doing something.” They did notice a change in the creek and they knew it was different from what we’d worked so hard to clean up. I even got some calls from people who weren’t members of the watershed [group] and didn’t participate. All the Johnsons called, the Millers, John Wilson, the Taylors. I think a Davis called. And [my wife] got calls at the house. Rickie from down in the city had called. They called one right after the other – almost as soon as [the state environmental protection agency] did it. [I came home from work and] run up real quick, the [state agency] was doing maintenance [on the acid mine drainage treatment system] but not doing Best Management Practices – they were just letting the effluent run right into the creek. —Bob Clark,1 co-founder of a community watershed group in central Appalachia. These 2008 events took place in central Appalachia, a resource-dependent region of the United States, where no person or company is legally responsible or liable for creeks running red with acid mine drainage from abandoned coal mines. The moment described here illustrates a key finding of this paper: formal watershed groups operate as a neighbor within a web of informal support among watershed residents. Following these events, the watershed group confronted the state environmental protection agency, suggested an alternative maintenance strategy, and stopped the effluent from running directly into the creek. In this example, the watershed group was accessible and responsive to requests from a range of neighbors, members, and non-members alike. This is one of the many ways in which watershed groups in this study benefited from actions taken by non-group-member residents,2 thus bolstering the group's ability to monitor and improve water quality in streams. This study focuses on understanding how watershed groups have persisted in addressing water-quality-related issues in rivers and streams in a region with extensive pollution, limited financial resources, and low levels of community-level social capital. While conducting this research, we discovered that the persistence and success of the formal watershed groups depended in large part on a foundation of local informal neighboring networks. We document the extent and characteristics of links between and within geographic communities and formal watershed organizations. We then provide examples of ways in which these links affect watershed group persistence and performance. The watershed groups represent formal institutions that are legally registered nonprofit groups with structured rules and procedures, while the communities of neighbors represent informal institutions, with beliefs and practices that operate alongside and in support of the more formal groups (Prell et al. 2010). Our research suggests that these watershed groups also act as neighbors – giving and receiving neighboring acts from and to individuals in the watershed – and, in this way, augment the theoretical concept of nestedness in commons governance. Previously, this concept has focused on the nesting of formal organizations within larger governance structures (e.g. Ostrom 1990; Cox et al. 2010); here we include intra-community networks of support. Our study reflects the importance of both informal neighboring ties and also formal group membership to sustaining watershed protection efforts in two Appalachian watersheds. Our findings suggest the need for better understanding the complex interchange that occurs between geographic communities and formal organizations, such as watershed groups, probing what benefits that interchange might offer. As such, neighboring ties illuminate the nestedness and permeability of these geographic community/organization boundaries. The historical, ecological, institutional, and cultural contexts of the two Appalachian watersheds in this study may, in part, relate to why informal acts are so important in this and other settings. Prior to the active involvement of watershed groups, the waterways in this study were highly degraded, sporadically managed resources. The U.S. Environmental Protection Agency considers the two primary sources of pollution – acid mine drainage from coal mines abandoned prior to 19773 and untreated household sewerage “straight piped” directly into streams – to be “nonpoint source pollution” (U.S. Environmental Protection Agency 2013). This designation means that residents lack legal recourse to systematically address the pollution; discharge permits are not required; and effluent limits do not apply to nonpoint sources. Although legal ownership of streams is vested by statute in West Virginia and administered by the West Virginia Public Lands Corporation, the Public Lands Corporation has not promulgated regulations to actively manage or determine upstream limits of waterways held in the public trust (George 1998). The watershed groups in this study formed in response to this largely unregulated pollution that plagues many Appalachian watersheds. Although not legally stream owners, watershed groups are part of a movement to reduce pollution from the resource system and create institutions to govern the de facto commons at the local level where governance is lacking or intermittent.4 Both groups in this study were 501(c)(3) nonprofit organizations, had clearly defined internal roles, and were working toward clean water in waterways. Working to produce change through direct action (e.g. stream restoration), the groups in this study behaved like action collaboratives (Margerum 2008), created by and comprised mostly of local residents living in the watersheds where the groups are working. Citizen-based watershed groups are more likely to pressure governmental entities to make policy changes than groups containing a mix of members from the public and private sectors (Koontz and Johnson 2004). These groups also are less likely to have social networks that provide financial and political support for their on-the-ground efforts (Floress et al. 2011). Few watershed-group studies consider the relationship between watershed group persistence and residents of the geographic area served by the watershed group. Although many watershed groups strive to be stakeholder collaborations comprised of representatives of diverse interests, attaining representative or robust participation from individuals living throughout the watershed is often challenging (Samuelson et al. 2005; Larson and Lach 2008). This is especially true among residents in rural areas without technical skills related to watershed planning (O’Neill 2005). Much of the existing research on watershed groups has been based on information from watershed group leaders or coordinators (Cline and Collins 2003; Koontz and Johnson 2004). Challenges arise with this approach as these individuals may have a biased or limited view of the group and its outcomes (Leach 2002), and such studies may fail to illuminate often-obscured roles of local residents who may support the group in ways other than direct participation: the role of the geographic community of residents, or the neighbors, in watershed protection is largely invisible in such literature. Morton and colleagues provide an exception (2009, 2011) by analyzing the importance of local residents in sustaining water-quality outcomes. Morton and Brown (2011) call this the “citizen effect,” which underpins the accomplishments of the formal organization and contributes to the organization's ability to achieve its mission. Morton (2008) demonstrated that knowledge about farming practices spread during social interactions among neighboring farmers, rather than through top-down government programs. Morton's research suggests that social relationships within a community – among farmers and non-farmers, as well as among individuals and groups – can lead to adopting best management practices and developing social norms around environmentally related practices (Morton 2008; Morton and Weng 2009; Morton and Brown 2011). Ostrom's foundational work, Governing the Commons (1990), identified principles of long-enduring commons governance institutions. Consistent with Ostrom's principles, watershed groups match resource and management boundaries by defining the physical boundaries of their work according to the watershed (Sabatier et al. 2005). In persistent commons governance systems, Ostrom (1990) found that community-based governance tends to be nested with larger governance structures involving cross-scale linkages. A local governance organization may be linked to external institutions such that “appropriation, provision, monitoring, enforcement, conflict resolution, and governance activities are organized in multiple layers” (Ostrom 1990, 19). In this way, layers of rules – such as those related to operational, collective-choice, and constitutional aspects of governance – become embedded in the commons system across geographic scales (Ostrom 1990; Carlsson and Berkes 2005). Scholars have extended and refined Ostrom's principle of nestedness to include political dimensions of cross-scale linkages (Kashwan and Holahan 2014), as well as the importance of subsidiarity and autonomy of community-based groups within nested systems (Marshall 2007). Studies of commons governance suggest that horizontal linkages between groups in different communities or between resource user groups may be another form of nesting (Cox et al. 2010). Robust commons governance also depends on accounting for “multiple actors with multiple interests that make up communities, the processes through which these actors interrelate, and especially, the institutional arrangements that structure their interactions” (Agrawal and Gibson 2001, 12–13). Yet, current research on the commons or watershed groups rarely describes how individuals residing within the resource system, but who are not formally part of user groups, may affect the group's local-level governance. In contemporary settings, user groups may only represent a subset of the residents and include stakeholders, such as former residents or anglers, who are not confined to a particular geographic place. We distinguish nestedness at the local level from co-existence by the reliance of the local resource management organization on local resources and rules external to the organization. This case study of persisting watershed protection augments the concept of nestedness to include that of a formal group nested within an informal network of recipients or providers of neighboring acts. Neighboring acts have been studied in the context of crime and livelihoods (e.g. Jacobs 1961; Halperin 1990; Bellair 1997), yet they rarely have been considered in empirical research on commons governance, more broadly, or watershed groups, specifically. Our conceptualization of neighboring – informal actions taken within a geographic community that build social capital – follows that of Wilkinson (2007, 216) in understanding neighboring as a “set of reported behaviors,” rather than considering it to be a state of being or an attitude. We use social capital as it is applied in the framework for analyzing social-ecological systems; that is, it relates to norms of reciprocity and trust and is an attribute of the actors of the resource system (Ostrom 2009, Ostrom and Cox 2010). In this section, we describe the often-invisible ways of learning, acting, and networking that are part of neighboring. We consider why they are likely important to commons governance. Although definitions and measures differ in the literature, neighboring acts are usually characterized by both the frequency and nature of interactions with neighbors (Table 1). Bolland and McCallum (2002) distinguish neighboring from friendship in that neighboring is based on proximity and can be characterized by rational, rather than emotional, engagement. Neighboring includes both social interaction and social support, which can be personal, instrumental, and/or informational; neighboring may also reinforce or legitimize social and cultural norms regarding acceptable and expected behavior (Unger and Wandersman 1985). Lund (2003), for example, differentiates between frequency of unplanned interactions and frequency of giving/receiving assistance to/from neighbors. Measures of neighboring in the literature. Watch their home while they are away? Take care of their kids? Talk with them about a personal problem? Visit them in their home? Give them information about neighborhood activities? Research in areas ranging from crime prevention to natural resource management suggests that successful commons governance relies on interaction and information exchange between groups and individuals within the community who do not normally interact (Bellair 1997; Crona and Bodin 2006). In a high-poverty inner-city neighborhood, neighboring was found to predict collective actions such as working with neighbors to solve neighborhood problems and contacting elected officials (Bolland and McCallum 2002). In a study of neighborhood crime, Bellair (1997, 677) found attendance at a yearly gathering among neighbors to be strongly and consistently negatively correlated with events of burglary, motor vehicle theft, and robbery. Although more frequent social interactions with the same group of people might exacerbate neighborhood differences and inequalities, Bellair's (1997) research suggests that, for crime prevention, connecting with neighbors at least once a year is critical. Although neighboring has not been explicitly studied in the context of watershed protection, social network and social interaction theory suggest its importance for resource and neighborhood protection. First, the geographic community of people living near the resource cannot be separated from the protection of the resource (Berkes 2004). In the case of the watershed, it is difficult, if not impossible, for an external entity to detect unpredictable, immediate, and acute pollution threats. Second, neighborhood residents have access to information about how water sources are changing and also can positively influence, legitimize, reinforce, or undermine the efforts of the watershed group. (This is similar to the pragmatic rationale for public participation in watershed efforts identified by Larson and Lach 2008.) Last, many difficult-to-measure cultural and social norms within a community are important to the success and persistence of watershed protection efforts (e.g. Morton 2008). The Appalachian Region of the United States stretches from southern New York to northern Mississippi (Appalachian Regional Commission 2008). Our research takes place in two central Appalachian watersheds with geographically isolated communities. Despite being rich in coal and natural gas resources, the region is characterized by persistent poverty (Thorne et al. 2004). Similar to other resource-dependent places (Peluso et al. 1994), the boom-and-bust cycles of coal mining and associated employment have had a significant impact on the region's demographics. In West Virginia (the only state located entirely within Appalachia), coal employment reached a high in 1940, with over 130,000 coal miners. With increasing mechanization, employment in the coal industry declined and, by 2009, only about 21,000 coal miners remained employed in West Virginia (West Virginia Office of Miners’ Health Safety and Training 2011). The political and physical geography of Appalachian watersheds shape the boundaries within which watershed groups take action. The watershed groups in this study were working in the same communities that were built, owned, and operated by the coal companies – communities that witnessed the “mining wars” in the first half of the 1900s, during which coal operators and even government officials used violent tactics to try to quell the unionization of coal mines (Lee 1969). Historically, residents had little opportunity to be engaged in civic life in coal company towns, as the companies owned the houses in which people lived and paid the salaries of teachers and preachers (Duncan 2001). Today, these often isolated settlements lack basic infrastructure, are declining in population, and suffer from the legacy of coal-related pollution, including acid mine drainage, burning piles of mine waste, and lack of adequate sewage disposal. The marginality of Appalachian coal-affected people has been well documented (Gaventa 1980; Stewart 1996). Because of a history of violence against formal labor organizations (e.g. Lee 1969), limited trust in social institutions (Duncan 1996), and the present-day politicized nature of environmental groups in southern West Virginia (Bell and Braun 2010), few locals may be willing to join a group or voluntarily interact with government officials. In addition, the region suffers from class divisions and low community-level social capital (Duncan 2001). This history of coal mining and resource dependence provides the backdrop for this research. Within this Appalachian context, we investigated the following research questions: (1) What are the extent and characteristics of links between and within geographic communities and formal watershed organizations? (2) How might these links affect a watershed group's success, in terms of persistence and performance? Although many local residents (“non-group-member residents”) did not identify as watershed group members, we found that these residents still supported the watershed groups in ways similar to what the literature describes as “neighboring acts.” This finding prompted us to analyze data collected from three primary sources: (1) survey of watershed group members (N=52) in two watersheds, (2) survey of non-group-member residents or local residents (N=48) who were not active participants in formal watershed groups in the same two watersheds, and (3) participant observation and consultation with key informants. We used an open-coding process to analyze qualitative data from these sources for themes as described in the literature on neighboring acts (e.g. information- and resource-sharing). For data reported herein, we differentiate between two groups of respondents who completed the surveys (Table 2): those we call “non-group-member residents” and those we call “watershed group members.” We administered surveys to non-group-member residents in summer 2009 after watershed group members had completed their surveys. Approximately 20% of the watershed group members did not live in the areas served by the watershed groups; by definition, all of the non-group-member residents lived within the watersheds. Watershed group members who resided within the watershed were similar on almost all socio-demographic measures (including education, income, gender, age, and length of residence) to non-group-member residents surveyed for this research. The only statistically significant difference between the two groups was that watershed group members were more likely to be retired than non-group-member residents. We do not anticipate that this difference biased our results. Response rates and sample size for two surveys. For the focus of this study, we selected two watershed groups working within two separate watersheds. Our criteria included that the watershed groups had been active for at least five years, completed watershed management plans, and had other visible successes, such as projects, events, and participation. We selected the Green River Watershed Association and the Harmon Creek Watershed Association. Both groups – located in central Appalachia, within 45 miles of each another – work to restore and protect streams and rivers in coal-affected areas. The Green River Watershed Association, which works to protect the 250-square-mile Green River watershed, underwent a transition from one paid coordinator to another during the time of this study. The Harmon Creek Watershed Association, which focuses on the 8-square-mile Harmon Creek watershed, did not have paid staff. We conducted a written survey with currently active group members in the two study watersheds. We administered the watershed group member survey in partnership with the Appalachian Coal Country Watershed Team – a nonpartisan, nonprofit organization based in Beckley, West Virginia. Leaders of each watershed group provided a list of all individuals who volunteered for either the Harmon Creek or Green River watershed group at least twice in the 12 months prior to completing the survey. We presented the list of active volunteers to additional watershed group board members for corrections and additions; we then compared the lists with event sign-in sheets and meeting minutes. We asked each survey respondent to describe his/her participation in the watershed group over the last year. Response rates were 94% (34 of 36) in the Harmon Creek watershed and 76% (19 of 25) in the Green River watershed (Table 2). We administered in-person surveys of a random sample of 48 residents from the two watersheds in this study at respondents’ homes. We used a paper-based questionnaire, which allowed documentation of additional commentary on each survey. Direct quotes from non-group-member residents were recorded at the time of the survey. Following conversations with key informants during pilot testing, we included questions related to community involvement and the respondent's relationship with watershed groups on the non-group-member survey. We consider three of these items similar to “neighboring acts” in the published literature: watching a neighbor's children, participating in a community crime watch, and tending a local park or cemetery. We asked open-ended questions about community involvement, such as, “Are there activities you do with the well-being of your local community in mind?” We also asked about individual acts of watershed protection and information-gathering, such as removing trash from a body of water or asking for the results of a water-quality test. We included items related to concepts found to be precursors to one's willingness to become involved in cleaning up local streams, such as awareness of the nearest stream/river and appraisal of its condition (Forsyth et al. 2004). The survey contained additional items related to awareness of and personal connections to the local watershed group. Our research focused on people who were likely to be potential volunteers for the watershed group – that is, people who lived nearest the river. In the larger Green River watershed, we included all houses directly adjacent to or with one neighbor between the house and river. We used Google maps and visual observation to identify and map all households in the sample population. Because of the smaller size of Harmon Creek, we made maps by hand after walking the hollow to identify inhabited houses. When confident that we had accounted for all inhabited houses, we assigned each house a unique number and randomly selected households based on this number. We contacted each household in person at least three times before selecting another household. To encourage survey response if the door was not answered, we left information sheets about the study, offered to return later, did not ask for names or other identifying information, and offered a $10 gift certificate for completing the survey. All respondents had to meet three requirements to receive the survey: (1) Residence in selected house, (2) over 18 years of age, and (3) had not completed or been asked to complete the survey for active watershed group members. Following this protocol, our final sample size was 48 residents. Our response rate in Green River was 67% (12 refusals) and 72% in Harmon Creek (9 refusals) (Table 2). Additional contextual data in the results section come from the first author's participant observation and personal communication with key informants. Key informants were watershed group leaders and government agency staff who worked closely with watershed groups. During 2008 and 2009, the first author attended watershed group meetings and events, reviewed group documents (e.g. meeting minutes, planning documents, and grant proposals), and received watershed group emails (intended for regular meeting attendees). As a participant observer, the first author kept detailed field notes and took care to gather a range of different perspectives on the same events, as advised by Emerson et al. (1995). The opening quote of this article, for example, was noted verbatim during a conversation with a key informant (pseudonyms used). We present our findings in two main sections corresponding to our two research questions. First, we describe the extent and characteristics of the links between and within geographic communities and watershed groups, as revealed through data collected related to neighboring acts (See Figure 1). Watershed groups gave and received in ways similar to the measures of neighboring in the literature. Neighboring acts connect geographic community and watershed group. Second, we discuss ways in which watershed groups were able to persist and achieve success due to the exchange of neighboring acts within and between local residents. We found information exchange between geographic communities and watershed groups, whereby watershed groups – sometimes through communication channels established or strengthened by neighboring acts – made pollution and solutions to pollution visible to those living in the watershed. With knowledge of the resource system, non-group-member residents were able to monitor the resource and help improve environmental outcomes. Connections between the watershed group and non-group-member-residents also reinforced social norms of watershed protection. Some neighboring acts improved environmental outcomes directly (e.g. monitoring the resource) while others supported the function and persistence of the group (e.g. cooking food for watershed-group events or watching a group member's child during a meeting). Many non-group-member residents were familiar with the watershed group and knew how to contact the group in case of a threat or concern, as demonstrated in the opening quotation. Awareness of the watershed group was higher in the smaller Harmon Creek watershed, where 19 of 23 non-group-member residents knew someone in the group personally and/or had been invited to a group event. Although by definition these respondents did not consider themselves watershed group members (and did not meet criteria to receive the watershed group member survey), 10 of the 23 reported that they had previously volunteered for the watershed group. In the larger Green River watershed, 11 of 25 non-group-member residents reported awareness of the group and social ties to the group. Of the 11 who were aware of the group, eight considered the township where the watershed group office was located as part of their “local community.” Two of the remaining three reported connections to the group through the location of the group office, and the other had participated in a watershed group program for kids in 4-H.
A 61-year-old retired respondent commented, “The majority of us that live up here, we just try to do for each other. It's just a good holler to be in. Period.” In the case study watersheds, every non-group-member resident reported being involved in his or her community through acts that would fall within our definition of neighboring (“A” in Figure 1). Of the Green River watershed respondents, 22 of the 25 answered positively to at least one of the three questions related to neighboring on the non-group-member survey (i.e. watched neighbors’ kids, participated in neighborhood crime watch, and/or tended a community park or cemetery). This was true for 21 of the 22 respondents in the Harmon Creek watershed. About half of the non-group-member residents had helped with a neighborhood crime watch, for example. Qualitative responses from the four who responded negatively to the pre-defined neighboring questions indicated that these individuals were also engaged in informal neighboring acts such as “keeping an eye out,” and regular interaction and communication with neighbors. A retired welder reported that neighbors asked him to share his expertise in welding on their projects. When asked how he is involved with his community, he responded, “They can holler at me anytime, and they do.” Some people reported being more comfortable or able to participate in one type of neighboring act rather than another. A 69-year-old widow, retired from retail, described providing support by taking neighborhood kids to doctor or dentist appointments, but did not “have the heart” to turn in neighbors as part of a crime watch. Neighboring was about recognizing opportunities to act and taking often-unplanned actions. Neighboring acts – on behalf of group members and non-group-member residents – directly benefited the process and outcomes of the watershed group in ways not easily visible to those outside the group or neighborhood. The data from the non-group-member residents indicate that the base of support for the watershed group extends beyond formal members (“B” in Figure 1). Social support networks of group members provided indirect support for the group itself. In the Green River watershed, for example, one non-group-member resident reported fixing computers for a group member. Another non-group-member resident donated his time and skills to prepare food behind the scenes at community events, including those hosted by the watershed group. In Harmon Creek, a non-group-member resident attended a reunion hosted by the watershed group and donated items for a watershed group fundraiser. Two additional themes were evident in both the surveys and through observation: taking care of the watershed group's physical space and taking care of the watershed itself. One non-group-member resident mentioned that her husband had been very involved in the watershed group: “It was like an 8-hour job for him. He put in the windows [in the watershed building] and did all sorts of work.” Another non-group-member reported helping the watershed group take care of a cemetery. On the group member survey, respondents reported doing neighborly tasks (“C” in Figure 1) related to the watershed group building, such as cleaning, cutting the grass, maintenance and construction work on the building, and community projects, in addition to watershed group activities (participating in meetings or stream cleanups). Another watershed group member reported clearing a fallen tree blocking road access to a watershed group restoration project. Many watershed residents – both members and non-members – were observed making coffee for the watershed group meetings, bringing home-cooked meals to watershed-related events, and taking care of each other's children and grandchildren. 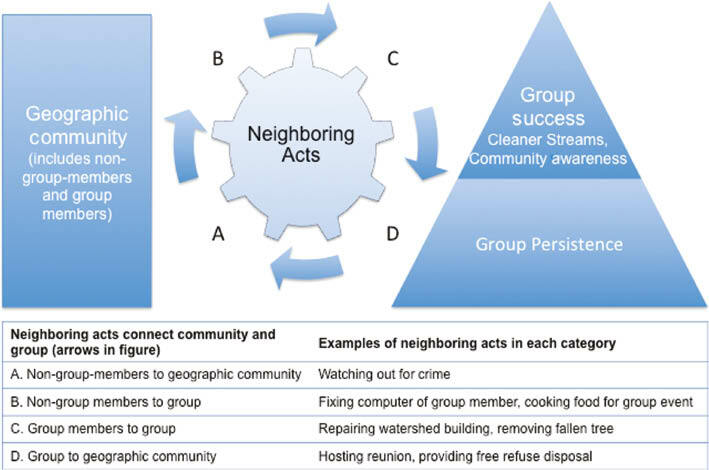 Watershed groups in this study engaged in neighboring acts similar to those in the literature, such as inviting neighbors over to visit and giving neighbors information about neighborhood activities (Bolland and McCallum 2002), and also facilitated neighboring acts between others (“D” in Figure 1). The groups were also accessible to non-group-member residents by sharing physical space during regular meetings, hosting events in or near the stream, and coordinating community events. The Harmon Creek Watershed Group hosted stream cleanups, during which all residents could dispose of household waste free of charge, regardless of membership. Following floods, the Green River Watershed Association repeatedly worked with neighbors to clean up nearby spaces. One such flood event happened during this research. The general membership meeting was cancelled and volunteers worked alongside other neighbors to clean out the building where the watershed group's office was located and group meetings were held. The Harmon Creek Watershed Association hosted a reunion to raise awareness, celebrate the place, and showcase positive group projects, an event that encouraged interaction and exchange. Current and past residents of this small watershed were invited and attended the reunion. Non-group-member residents and the watershed group exchanged information through frequent, often unplanned interactions. Approximately 80% of watershed group members were also residents of the watershed and resided near those who did not participate formally in the watershed group. Information flowed through channels created, in part, by neighboring acts and other personal connections between the watershed group and non-group-member residents. Watershed group made visible pollution and solutions. Similar to Morton's (2008) findings about interactions between neighboring farmers, the interaction between non-group-member residents and watershed groups influenced how individuals took action. As the watershed group members and non-members interacted, for example, pollution became recognized as unacceptable and solutions as demonstrated by the watershed group became visible. Through the results of water quality testing, the watershed group became aware of specific water pollutants – iron, manganese, aluminum, and other mining byproducts. With new information about pollutants, both watershed groups motivated the state environmental protection agency to list the streams as “impaired” and developed watershed-based plans with cleanup strategies. These actions allowed access to external government resources and also contributed to changes in the neighbors’ views of pollution and potential solutions. Many of the non-group-member residents in Harmon Creek had always known the creek to be red and, because of the persistence of the mine pollution as well as shifting baseline expectations, this was not believed to be a solvable problem. This expectation changed when the watershed group improved water quality and restored trout populations to the stream. When asked about the “condition of the local creek,” many non-group-member residents in Harmon Creek described the creek's improved condition, citing evidence of minnows, fish, and crawdads. Non-group-member residents who reported the river running red in this article's initial passage had lived near the creek long enough (30 years on average) to recognize that the creek – this time of year, after these rainfall conditions – was not “how it should be” when the actions of the state environmental protection agency threatened the restored fishery. Other times, having “eyes on the street” to watch for people dumping trash into the waterways made the critical difference. A non-watershed-group member mentioned that while she is “too old” to help clean the creek, she did report someone dumping trash. Another resident observed that “mine water” flowed down the creek after heavy rains, threatening fish populations. He expressed his concern directly to the watershed group. These actions demonstrated that the long-term maintenance of a healthy creek required attentiveness to local conditions by group and non-group-members alike. Our findings suggest that the social expectations and norms of neighboring – such as watching and helping – were extended to watershed group members and some non-group-member residents. One non-group-member respondent, a 53-year-old mother and retired teacher commented, “I’d like to see the creek taken care of so we can take better care of the community.” We also observed that watershed groups and others who supported them were actively changing social norms as they related to watershed protection, similar to the building of a civic community identified by Morton (2008). Illegal trash dumping was a leading concern of group members and non-group-member residents in both watersheds in this study, for example, and was a practice that watershed groups worked to eliminate. Today, in the Harmon Creek Watershed, there is little visible trash, yet nearby watersheds without groups still have significant trash dumps. The marked decrease in trash in the neighborhood likely made it easier for an individual to pick up trash on his or her own, thus amplifying the impact of the watershed group. Non-group-member residents agreed that it was important to keep the local waterways clean; many reported being engaged in individual acts that were an important part of watershed protection. One private resident who self-identified as “not a group person” said that he often cleans up the creek on his own as an expression of “pride in his area.” Several other non-group-member residents echoed this sentiment, mentioning the importance of taking care of their place. More than half (56%) of the non-group-member residents in our sample reported picking up trash from a body of water in the past year. The cumulative effect of individual and neighboring acts had visible and important impacts, contributing to social norms in the place. This paper explores how and why watershed groups – examples of de facto commons governance institutions – persisted and were successful in rural Appalachian watersheds characterized by high pollution, limited resources, and low community-level social capital. Our findings make visible the ways in which watershed groups were nested within informal community practices of neighboring and describe how that nested structure facilitated and enhanced watershed protection efforts. Our findings offer a new application of measures of neighboring in the academic literature (Lund 2003; Kusenbach 2006). Traditionally, these measures have represented interactions between individuals; we extend neighboring to include interactions between individuals and a group operating in the same geographic area. An individual-to-individual interaction focused on helping with “small tasks in/around the house,” for example, which is a measure of instrumental neighboring (van Eijk 2012), in this case extends to include help with small tasks in/around the watershed or the watershed building. Our findings indicate that neighboring acts, or the informal actions taken within a geographic community that build social capital, were commonplace and often unplanned. We found three key features of neighboring that contributed to watershed protection that may apply more broadly to commons governance. First, residents in these watersheds were present in and paid attention to the local environment. Related to Kusenbach's (2006) Proactive Intervention, or “Watching Out,” principle of neighboring, everyday monitoring contributed to watershed protection. Second, neighbors responded to requests from other neighbors for assistance and/or recognized opportunities to act on behalf of their communities with activities, such as reporting trash dumping or tending a public park. In this case, giving and receiving assistance to/from neighbors (e.g. Lund 2003) was extended to the watershed commons. Third, local residents were willing to take unplanned or unscheduled action such as reporting illegal trash dumping. This echoes past neighboring studies emphasizing the unplanned nature of neighboring acts: asking for help when sick (van Eijk 2012), frequency of unplanned interactions (Lund 2003), or Friendly Recognition (Kusenbach 2006). Our findings demonstrate that willingness to engage in unplanned tasks was also critical to the monitoring and maintenance of watershed projects and conditions, particularly where change in the resource was unexpected and rapid. Frameworks for analyzing Institutional Analysis and Development (IAD) and the sustainability of social-ecological systems (Ostrom 2009; Ostrom and Cox 2010) provide insight into the relationship between resource systems, governance systems, and the actors within them. Our findings contribute to these frameworks by bringing attention to the geographic community of residents, especially non-group-members. Under certain circumstances, the local residents we highlight, who are not formally part of governance groups, take part in actions affecting resource governance. We describe neighboring acts through which geographic communities connect with and support community watershed groups and clean streams. Neighboring acts are observable and can be measured, while many intra-community dynamics are difficult to measure. Our findings suggest that certain aspects of the “social setting” in the social-ecological systems framework and the “attributes of the community” in the Institutional Analysis and Development may influence the governance process and outcomes; thus, they should be considered endogenous to the system. Moreover, our findings indicate that the watershed groups build social capital (trust and norms of reciprocity) within the community beyond the group itself. In this way, in the social-ecological system framework, social capital is not only an attribute of the actors, but it can also include non-group-member residents of the geographic community. In Appalachia, flooding, mine bursts, and pollutant spills are unpredictable. As those living near these occurrences are the first to observe and be affected, they can also be the first to report and mitigate potential damages. In addition to noticing threats when they happen, being in the community may facilitate long-term monitoring of restoration. Our findings suggest that, when engaged, local residents enhanced the monitoring capacity of watershed organizations. Monitoring, which involves taking measurements over time of biological and physical variables with the intention of identifying both ecological impacts to the resource as well as patterns of use (Lovett et al. 2007), requires regular engagement with the resource. Adaptive management draws attention to the importance of monitoring, not only in terms of the ability to identify violators quickly and enforce regulations, but also in terms of understanding the resource and adjusting management based on changing conditions (Berkes 2009). Monitoring also requires rapid response to changes or threats, facilitated through commons governance; this contrasts to the actions of a formal organization with structured, pre-organized meetings and work hours. In our study, local residents, who were the first to observe and report violations or changes in water quality, are similar to the “sniffers” in the Louisiana and California “bucket brigades” who alert a trained sampler when they detect a potential air-quality problem (O’Rourke and Macey 2003), or the shopkeepers who deter potential perpetrators of crime simply by having their “eyes on the street” (Jacobs 1961). Although everyday monitoring is an important form of participation for watershed protection, it is often invisible to regulatory agency staff. By contrast, watershed groups, such as the Harmon Creek Watershed Association, recognize the value of this type of neighboring act to restoration. These two cases demonstrate the nestedness of an organization – itself a neighbor – in a community, neighborhood, and network of neighboring acts. In addition to more commonly discussed elements of co-management and cross-scale interactions (e.g. Cox et al. 2010), we strive to illuminate the concept of nestedness, often invisible outside the community. Nestedness is usually defined by how a group interacts vertically with state agencies or other levels of governance (Carlsson and Berkes 2005) or horizontally, with respect to a community group interacting with other groups (Cox et al. 2010). In our case, we observed a broader phenomenon of nestedness occurring within a geographic community, with watershed groups acting as neighbors, giving and receiving neighboring acts. Neighboring acts initiated by the watershed group – hosting events at their space, monitoring changes in the watershed, cleaning up physical spaces shared with other neighbors – encouraged social interaction and generated social capital. We observed an informal process of information exchange between neighbors and a group; a similar process of building social infrastructure contributed to the highly successful restoration of the Long Tom Watershed in Oregon (Flitcroft et al. 2009). Our findings affirm those of Morton (2008): to maintain environmental outcomes of watershed groups, the social norm of watershed protection must extend beyond those formally involved. The watershed groups encouraged neighboring acts related to watershed protection by demonstrating success in a visible way and showing that collective and individual actions could contribute positively to a place. By recognizing opportunities to engage residents in diverse forms of participation, the watershed groups validated the multiplicity of ways in which people could and were giving to their communities. Although many of the neighboring acts were functional – such as repairing the watershed building, hosting a picnic, or responding to an emergency – they also developed into social norms, laying the groundwork for future collective action. The groups in this study were part of the civic structure (Morton 2008) and enhanced community-level social capital (Duncan 2001) in a resource-dependent area otherwise characterized by the decline of population and social capital (Bell 2009). Although the watershed groups in this study filled a governance gap, long-term watershed restoration also requires active, accountable government participation. While neighboring acts create social capital, restoration projects also require financial capital to be built, maintained, and monitored (Lukacs and Ortolano 2015). Leach and Sabatier (2005) found that, while social capital led to higher levels of agreement about watershed group projects and goals, financial capital was necessary for project implementation. Weber (2003, 11) raises important questions about accountability – defined as “a system, or set of mechanisms, designed to make sure promises are kept, duties are preformed, and compliance is forthcoming” – in local-level commons governance that are relevant to this paper. To whom, and for what actions and outcomes, are the government and/or watershed groups accountable? The Harmon Creek Watershed Group, for example, received state and federal grants to build a treatment system for acid mine drainage from abandoned mines, extending their accountability beyond the local level. In addition to watershed residents monitoring the stream for changes, the watershed groups needed access to external financial and technical resources. Moreover, this study's watershed groups have no formal authority to hold polluters or government agencies accountable; rather they rely on current government regulation and enforcement to curb pollution from active coal mines, prevent future abandoned coal mines, and provide funding for water quality, safety, and health threats from coal mines abandoned prior to federal and state regulation. The nestedness of the watershed groups within external government structures remains critical and complementary to the type of community nestedness we discuss. Our research reveals the importance of both local residents and community watershed organizations in improving water quality in streams. This study's watershed groups are caretakers of water resources in places plagued by nonpoint source pollution from abandoned mines and other sources. They have worked persistently to monitor water quality, install and maintain treatment systems, and support their communities more broadly. More than simply co-existing, we describe the nestedness of formal and informal institutions for improved watershed protection in Appalachia. This nesting facilitates the exchange of neighboring acts – such as resources, expertise, and information – between watershed groups and non-group-member residents. The nesting of a group as a neighbor reinforces neighboring and watershed protection as social norms. In this study, networks comprised of group and non-group-members facilitated robust and regular opportunities for local residents to engage in commons governance in resource-extractive areas. The concept of neighboring acts may be particularly relevant in contested contexts, such as Appalachia, where residents may perceive visible or organized group participation as risky. Neighboring acts may also be important facilitators of collective action in other resource-extractive environments, where resource-related changes can happen rapidly with potentially damaging environmental and social consequences. By providing alternative avenues for participation, such acts may offer a safe social and physical space for community engagement at the local level and, in this way, may engage a range of people – watershed group members and non-members alike – in actively improving the state of their community and their environment. 1All people and place names are pseudonyms. 2Non-group-member residents live within the watershed but are not members of a local watershed group. 3The federal Surface Mining Control and Reclamation Act, enacted in 1977, regulates water quality discharges from mining operations in the United States. 4De facto represents rights and authority in practice while de jure refers to legal rights and authority. 5We appreciate [community partner’s blinded] astute observation that the area norms include giving and receiving informal neighboring acts. We deeply appreciate the many important contributions of Louise Fortmann and her research group at the University of California Berkeley to this paper; Mike King, Joseph Campbell, Ashley Jones, and watershed group volunteers and staff who were instrumental in survey development and data collection; and Mehana Blaich Vaughan, Jenna Davis, Len Ortolano, Shannon Bell, Alice Kelly, and Wendi Hoover for thoughtful feedback on paper drafts. Agrawal, A. and Gibson, C. C. (2001). Introduction: The Role of Community in Natural Resource Conservation In: Communities and the Environment: Ethnicity, Gender, and the State in Community-based Conservation. Agrawal, A. and Gibson, C. C. eds. : 1–31. Piscataway, NJ: Rutgers University Press. http://dx.doi.org/10.1016/b978-075067351-8/50078-7. Appalachian Regional Commission.. Map of Appalachian Region, http://www.arc.gov/appalachian_region/MapofAppalachia.asp. Bell, S. E. (2009). “There Ain’t No Bond in Town Like There Used to Be:” The Destruction of Social Capital in the West Virginia Coalfields. Sociological Forum 24(3): 631–657. http://dx.doi.org/10.1111/j.1573-7861.2009.01123.x. Bell, S. E. and Braun, Y. A. (2010). Coal, Identity, and the Gendering of Environmental Justice Activism in Central Appalachia. Gender & Society 24(6): 794–813. http://dx.doi.org/10.1177/0891243210387277. Bellair, P. E. (1997). Social Interaction and Community Crime: Examining the Importance of Neighbor Networks. Criminology 35(4): 677–704. http://dx.doi.org/10.1111/j.1745-9125.1997.tb01235.x. Berkes, F. (2004). Rethinking Community-based Conservation. Conservation Biology 18(3): 621–630. http://dx.doi.org/10.1111/j.1523-1739.2004.00077.x. Berkes, F. (2009). Evolution of Co-management: Role of Knowledge Generation, Bridging Organizations and Social Learning. Journal of Environmental Management 90(5): 1692–1702. http://dx.doi.org/10.1016/j.jenvman.2008.12.001. Bolland, J. M. and McCallum, D. M. (2002). Neighboring and Community Mobilization in High-poverty Inner-city Neighborhoods. Urban Affairs Review 38(1): 42–69. http://dx.doi.org/10.1177/107808702401097790. Carlsson, L. and Berkes, F. (2005). Co-management: Concepts and Methodological Implications. Journal of Environmental Management 75(1): 65–76. http://dx.doi.org/10.1016/j.jenvman.2004.11.008. Cline, S. A. and Collins, A. R. (2003). Watershed Associations in West Virginia: Their Impact on Environmental Protection. Journal of Environmental Management 67(4): 373–383. http://dx.doi.org/10.1016/S0301-4797(02)00222-0. Cox, M., Arnold, G. and Villamayor-Tomás, S. (2010). A Review of Design Principles for Community-based Natural Resource Management. Ecology and Society 15(15): 4. http://www.ecologyandsociety.org/vol15/iss4/art38/. Crona, B. and Bodin, Ö. (2006). What You Know is Who You Know? Communication Patterns Among Resource Users as A Prerequisite for Co-management. Ecology and Society 11(11): 2. http://www.ecologyandsociety.org/vol11/iss2/art7/. Duncan, C. M. (1996). Understanding Persistent Poverty: Social Class Context in Rural Communities. Rural Sociology 61(1): 103–124. http://dx.doi.org/10.1111/j.1549-0831.1996.tb00612.x. Duncan, C. M. (2001). Social Capital in America's Poor Rural Communities In: Social Capital and Poor Communities. Saegert, S., Thompson, J. P. and Warren, M. R. eds. : 60–86. New York: Russell Sage Foundation. Emerson, R. M., Fretz, R. I. and Shaw, L. L. (1995). Writing Ethnographic Fieldnotes. Chicago, IL: University of Chicago Press. http://dx.doi.org/10.7208/chicago/9780226206851.001.0001. Flitcroft, R. L., Dedrick, D. C., Smith, C. L., Thieman, C. A. and Bolte, J. P. (2009). Social Infrastructure to Integrate Science and Practice: the Experience of the Long Tom Watershed Council. Ecology and Society 14(2): 36. http://www.ecologyandsociety.org/vol14/iss2/art36/. Floress, K., Prokopy, L. S. and Allred, S. B. (2011). It's Who You Know: Social Capital, Social Networks, and Watershed Groups. Society and Natural Resources 24(9): 1–16. http://dx.doi.org/10.1080/08941920903493926. Forsyth, D. R., Garcia, M., Zyzniewski, L. E., Story, P. A. and Kerr, N. A. (2004). Watershed Pollution and Preservation: The Awareness-appraisal Model of Environmentally Positive Intentions and Behaviors. Analyses of Social Issues and Public Policy 4(1): 115–128. http://dx.doi.org/10.1111/j.1530-2415.2004.00037.x. Gaventa, J. (1980). Power and Powerlessness: Quiescence and Rebellion in An Appalachian valley. Urbana, IL: University of Illinois Press. George, L. W. (1998). Public Rights in West Virginia Watercourses: A Unique Legacy of Virginia Common Lands and the Jus Publicum of the English Crown. West Virginia Law Review 101: 407–470. Halperin, R. H. (1990). The Livelihood of Kin: Making Ends Meet “The Kentucky Way”. Austin, TX: University of Texas Press. Jacobs, J. (1961). The Death and Life of Great American Cities. New York, NY: Random House, Inc.
Kashwan, P. and Holahan, R. (2014). Nested Governance for Effective REDD+: Institutional and Political Arguments. International Journal of the Commons 8(2): 554–575. http://www.thecommonsjournal.org/index.php/ijc/article/view/450. http://dx.doi.org/10.18352/ijc.450. Koontz, T. M. and Johnson, E. M. (2004). One Size Does Not Fit All: Matching Breadth of Stakeholder Participation to Watershed Group Accomplishments. Policy Sciences 37(2): 185–204. http://dx.doi.org/10.1023/B:OLIC.0000048532.94150.07. Kusenbach, M. (2006). Patterns of Neighboring: Practicing Community in the Parochial Realm. Symbolic Interaction 29(3): 279–306. http://dx.doi.org/10.1525/si.2006.29.3.279. Larson, K. L. and Lach, D. (2008). Participants and Non-participants of Place-based Groups: An Assessment of Attitudes and Implications for Public Participation in Water Resource Management. Journal of Environmental Management 88(4): 817–830. http://dx.doi.org/10.1016/j.jenvman.2007.04.008. Leach, W. D. (2002). Surveying Diverse Stakeholder Groups. Society & Natural Resources 15(7): 641–649. http://dx.doi.org/10.1080/08941920290069245. Leach, W. D. and Sabatier, P. A. (2005). Are Trust and Social Capital the Keys to Success? Watershed Partnerships in California and Washington In: Swimming Upstream: Collaborative Approaches to Watershed Management. Sabatier, P. A., Focht, W., Lubell, M., Trachtenberg, Z., Vedlitz, A. and Matlock, M. eds. : 232–258. Cambridge, MA: MIT Press. Lee, H. B. (1969). Bloodletting in Appalachia: The Story of West Virginia's Four Major Mine wars and Other Thrilling Incidents of Its Coal Fields. Morgantown, WV: West Virginia University. Lovett, G. M., Burns, D. A., Driscoll, C. T., Jenkins, J. C., Mitchell, M. J., Rustad, L., Shandley, J. B., Likens, G. E. and Haeuber, R. (2007). Who Needs Environmental Monitoring?. Frontiers in Environmental Ecology 5(5): 253–260. http://dx.doi.org/10.1890/1540-9295(2007)5[253:WNEM]2.0.CO;2. Lukacs, H. and Ortolano, L. (2015). West Virginia Has Not Directed Sufficient Resources to Treat Acid Mine Drainage Effectively. The Extractive Industries and Society 2: 194–197. http://dx.doi.org/10.1016/j.exis.2014.12.002. Lund, H. (2003). Testing the Claims of New Urbanism: Local Access, Pedestrian Travel, and Neighboring Behaviors. Journal of the American Planning Association 69(4): 414–429. http://dx.doi.org/10.1080/01944360308976328. Margerum, R. D. (2008). A Typology of Collaboration Efforts in Environmental Management. Environmental Management 41(4): 487–500. http://dx.doi.org/10.1007/s00267-008-9067-9. Marshall, G. (2007). Nesting, Subsidiarity, and Community-based Environmental Governance Beyond the Local Scale. International Journal of the Commons 2(1): 75–97. http://www.thecommonsjournal.org/index.php/ijc/article/view/50. http://dx.doi.org/10.18352/ijc.50. Morton, L. W. (2008). The Role of Civic Structure in Achieving Performance-based Watershed Management. Society and Natural Resources 21(9): 751–766. http://dx.doi.org/10.1080/08941920701648846. Morton, L. W. and Weng, C. Y. (2009). Getting to Better Water Quality Outcomes: The Promise and Challenge of the Citizen Effect. Agriculture and Human Values 26(1–2): 83–94. http://dx.doi.org/10.1007/s10460-008-9175-4. Morton, L. W. and Brown, S. S. (2011). Pathways for Getting to Better Water Quality: The Citizen Effect. New York, NY: Springer Science+Business Media, LLC. O’Neill, K. M. (2005). Can Watershed Management Unite Town and Country?. Society and Natural Resources 18(3): 241–253. http://dx.doi.org/10.1080/08941920590908097. O’Rourke, D. and Macey, G. P. (2003). Community Environmental Policing: Assessing New Strategies of Public Participation in Environmental Regulation. Journal of Policy Analysis and Management 22(3): 383–414. http://dx.doi.org/10.1002/pam.10138. Ostrom, E. (1990). Governing the Commons: The Evolution of Institutions for Collective Action: The Political Economy of Institutions and Decisions.. Cambridge, UK: Cambridge University Press. http://dx.doi.org/10.1017/CBO9780511807763. Ostrom, E. (2009). A General Framework for Analyzing Sustainability of Social-ecological Systems. Science 325: 419–422. http://dx.doi.org/10.1126/science.1172133. Ostrom, E. and Cox, M. (2010). Moving Beyond Panaceas: A Multi-tiered Diagnostic Approach for Social-Ecological Analysis. Environmental Conservation 37(4): 451–463. http://dx.doi.org/10.1017/S0376892910000834. Peluso, N. L., Humphrey, C. R. and Fortmann, L. P. (1994). The Rock, the Beach, and the Tidal Pool: People and Poverty in Natural Resource-dependent Areas. Society & Natural Resources 7(1): 23–38. http://dx.doi.org/10.1080/08941929409380842. Prell, C., Reed, M., Racin, L. and Hubacek, K. (2010). Competing Structure, Competing Views: The Role of Formal and Informal Social Structures in Shaping Stakeholder Perceptions. Ecology and Society 15(4): 34–52. http://www.ecologyandsociety.org/vol15/iss4/art34/. Sabatier, P. A., Focht, W., Lubell, M. and Trachtenberg, Z. (2005). Swimming Upstream: Collaborative Approaches to Watershed Management. Cambridge, MA: MIT Press. Samuelson, C. D., Vedlitz, A., Whitten, G. D., Matlock, M., Alston, L. T., Peterson, T. R. and Gilbertz, S. J. (2005). Citizen Participation and Representation in Collaborative Engagement Processes In: Swimming Upstream: Collaborative Approaches to Watershed Management. Sabatier, P. A., Focht, W., Lubell, M., Trachtenberg, Z., Vedlitz, A. and Matlock, M. eds. : 137–170. Cambridge, MA: MIT Press. Stewart, K. C. (1996). An Occupied Place In: Senses of Place. Field, S. and Basso, K. H. eds. : 137–165. Santa Fe, NM: School of American Research Press. Thorne, D., Tickamyer, A. and Thorne, M. (2004). Poverty and Income in Appalachia. Journal of Appalachian Studies 10(3): 341–357. Unger, D. G. and Wandersman, A. (1985). The Importance of Neighbors: The Social, Cognitive, and Affective Components of Neighboring. American Journal of Community Psychology 13(2): 139–169. http://dx.doi.org/10.1007/BF00905726. U.S. Environmental Protection Agency (EPA). Non-point Source Categories. http://water.epa.gov/polwaste/nps/categories.cfm. Van Eijk, G. (2012). Good Neighbors in Bad Neighborhoods: Narratives of Dissociation and Practices of Neighboring in A ‘Problem’ Place. Urban Studies 49(14): 3009–3026. http://dx.doi.org/10.1177/0042098012439110. Weber, E. P. (2003). Bringing Society Back in: Grassroots Ecosystem Management, Accountability, and Sustainable Communities In: Cambridge, Massachusetts: MIT Press. West Virginia Office of Miners’ Health Safety and Training. Production of Coal and Coke in West Virginia 1863–2011. http://www.wvminesafety.org/STATS.HTM. Wilkinson, D. (2007). The Multidimensional Nature of Social Cohesion: Psychological Sense of Community, Attraction, and Neighboring. American Journal of Community Psychology 40(3): 214–229. http://dx.doi.org/10.1007/s10464-007-9140-1.